The FBI reports that anti-Muslim hate crimes rose 67 percent within the last year. Based on my communication with a lot of young Muslim girls, who have reached out to me confidentially to share their own run-ins with hate, I am concerned that the real number of hate crimes against Muslims is much higher. 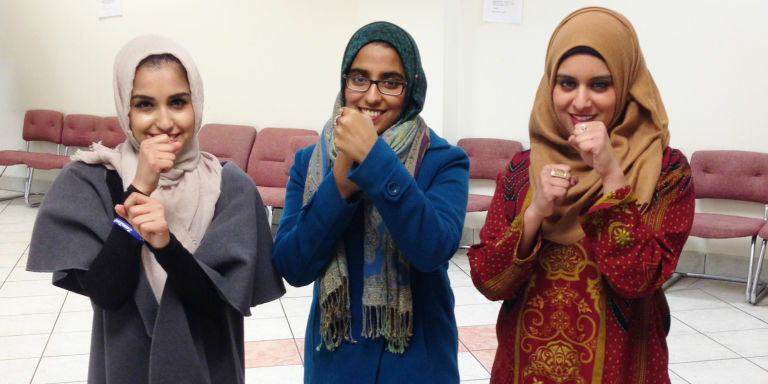 Of all Muslims, hijabis are the easiest to identify–and are therefore the biggest target. But make no mistake, the stupidity of racists knows no boundaries. Christian Arabs, a large number of Sikhs, even a Buddhist monk have been attacked in the U.S. in the name of Islamophobia. Unfortunately, I can’t stop this type of ignorance on my own. I can’t even convince fellow women-of-color that wearing a safety pin is a really good idea as a signal for people getting harassed in public…but what I can do is educate those most targeted by Islamophobia on Situational Awareness (SA), which is one of the most important survival tools for hostile environments. First, let this really sink in: Women, especially women-of-color and women wearing hijabs, are now living in a chronic hostile environment. Statistically, women have always been an out-of-proportion target for violence, but whereas before we had to worry about walking home alone at night, or making sure that no one slips a roofie in our glass, or noticing that one guy online who doesn’t consider “NO” to be a full sentence…now we have to be on guard at all times. This election has signaled to young men that sexual assault is okay and that there are no consequences. On the contrary…it’s a character trait that can get you elected as president. Furthermore, racism and Islamophobia have been legitimized by this election result, so women-of-color & Muslim women are doubly at risk. I’m sharing this with you so that you understand the level of consciousness you are dealing with. Maybe some people will disagree with me on this, but in my opinion, a man who tries to tear a hijab off your head cannot be reasoned with or converted with kindness. Maybe later, yes, but not in the heat of that moment. By increasing your situational awareness, you’ll hopefully be able to avoid encounters like that. 1. Do not text, tweet or talk on the phone in public. You can hold your phone in your hand, in case you quickly need to call 911 or turn the camera on, but don’t look down on your phone and get distracted from your surroundings. Whenever you enter an enclosed, interior location (trains, restaurants, etc.) immediately locate all exits, find a spot that gives you the best field-of sight and sit down or stand with your back to the wall. 3. Do situational awareness exercises. In a crowd of people, start doing little situation awareness exercises. For example, count the amount of people who are wearing a watch, try to remember how many of those are wearing it on their right versus their left wrist (Bonus: by doing this exercise, you are observing everybody’s hands. Bad things (shooting, stabbing, punching) usually start with somebody’s hands. This is the first post in a series about situational awareness. We will survive this because the fire inside us burns brighter than the fire around us.